Not all forms are fillable. Sometimes form creators don’t convert their PDFs to interactive fillable forms. Or, they intentionally design a form that you must print and fill in by hand. These non-interactive forms are called flat forms. Purple bar across the top? The purple message bar indicates that the form is fillable. Depending on how the form was created, it could be “interactive” or “flat”. An interactive form contains fields that you can select or fill in. You can turn on the Auto-Complete option to help you fill in forms more quickly. A flat form does not have interactive fields. However, if available, you can use the Add Text Comment (Typewriter) tool to type over blank form fields. You can add text anywhere on the form, not only within specific boxes. The purple bar displays only if the creator of the form enabled it. Add Text Comment tool visible? Forms that display the Add Text Comment tool, let you add text anywhere on the form. If you don’t see the Add Text Comment tool palette as shown below, look for the tool in Comment > Annotations or Sign > I Need To Sign. If the Add Text Comment tool is available, you can add text anywhere on the form. The Add Text Comment tool is available only if the creator of the form enabled it. Yellow bar across the top? A yellow message bar may appear when you open a form in Reader. Protected View limits what you can do in a PDF to protect your computer from potentially malicious content. If you trust the source of the file, click Enable All Features. Once enabled, you can look for the purple message bar or Typewriter tool. A yellow message bar protects you from potentially risky files. No purple bar or Typewriter tool? If you don’t see a purple bar across the top or the Typewriter tool, your form is not fillable in Reader. You must print the form and fill it in by hand. Patti Sokol, of Sokol Consulting, created two sample forms to show the differences between a flat form and an interactive form. Click here to see a flat form. Notice that you cannot type in the fields of a flat form. Click here to see an interactive form. You can highlight the fields and type in them. Be sure to read the information in the top text box of each sample form. Then move your cursor over the fields to see what actions are available. You can also print and save the forms to your computer. An interactive fillable form contains fields that you can select or fill in. You can turn on the Auto-Complete option to help you fill in forms more quickly. In an interactive form, the pointer changes to a different icon, depending the field. For example, the Hand tool changes to an I-beam when you can type text into the form field. If necessary, right-click the document, and select either the Hand tool or the Select tool from the pop-up menu. 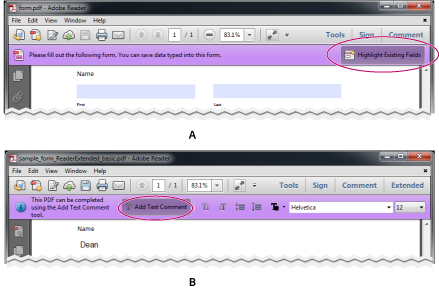 To make form fields easier to identify, click the Highlight Fields button on the purple document message bar. Form fields appear with a colored background (light blue by default). A colored outline (red by default) identifies required form fields. Click inside a text field to type. For check boxes or selection buttons, click the option you want to select. Press Tab to move forward or Shift + Tab to move backward. When finished, click the submit button to send the form data. The submit button can appear in the purple message bar at the top of the form or in the form itself. For troubleshooting tips on completing forms, see Troubleshooting forms. Reject and deselect form field. The Auto-Complete feature stores entries that you type in interactive form fields. Auto-Complete then suggests or even automatically enters responses that match your typing in other form fields. The suggestions appear in a pop-up menu, from which you can select a match. The Auto-Complete feature is off by default, so you must enable it in the Forms preferences if you want to use it. Choose Edit > Preferences (Windows) or Reader > Preferences (Mac OS) to open the Preferences dialog box. In the Preferences dialog box, click Forms from the list at left. Select Remember Numerical Data if you want to store numbers that you type into forms. If Auto-Complete includes unwanted entries, such as inadvertent misspellings, you can remove them. Under Auto-Complete, select Edit Entry List, and then remove or change the unwanted words. If the form creator enabled the Add Text Comment tool, use that tool to fill out flat forms. The text you add with the Add Text Comment tool appears in the Comments List (Comment > Comments List). In either the purple message bar or floating toolbar, click Add Text Comment. If the Add Text Comment option is unavailable, you must print the form to fill it out. Click a blank form field and type. (Optional) Adjust options in the purple message bar or floating toolbar to change the text size, position, or font. When finished, print a copy of the completed form. You cannot electronically submit a form filled out using the Add Text Comment tool. You must print the completed form. Not all forms can be saved. Completed forms can be saved only if the author of the form allows it. If the PDF author has enabled local saving, click the disk icon in the toolbar at the upper left of the window or in the floating toolbar if viewing the form on the web. Then rename the file and save the form with your information. The purple bar displays information, if you can save data typed into this form. Floating toolbar in form viewed on the web. When you open a form in Adobe Reader, you can view the usage rights in the notification bar above the form. Contact the author of the form to change your usage rights. In the upper left of the window, click the Print button . Choose a printer from the menu at the top of the Print dialog box. To print the form and the typed entries, choose Document. To print the form, the typed entries, and any comments on the form, choose Document And Markups. Select the reset form button, if one exists. You cannot undo this action. Quit the browser, and start again. Clicking the web browser’s Reload or Refresh button, the Back or Go Back button, or following a link to another page may not completely clear the form. In the upper right of the window, click Extended, and then click Import Data. In the upper right of the window, click Extended, and then click Export Data. For more information, see Manage form data files in Acrobat Help.